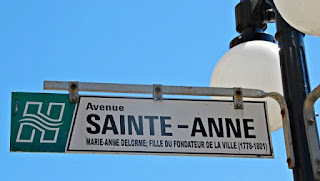 It is a distinctive characteristic in Quebec that many streets are named for saints. These are not only for specific saints, but may also recall the names of community founders or leaders, missionaries or priests. 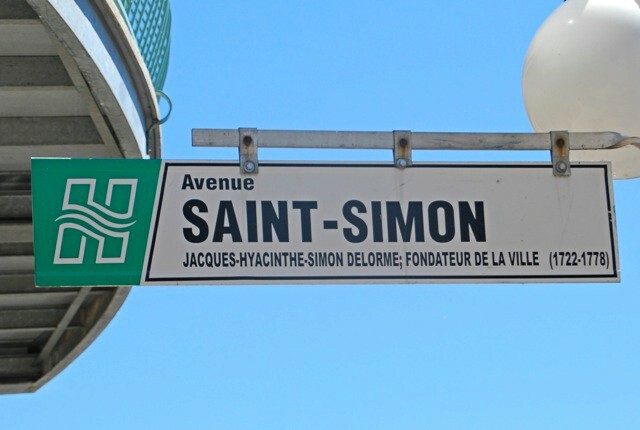 In this case, the city of Saint-Hyacinthe (named for St Hyacinthe of Krakow) features the street name of Saint-Simon, after the founder of the city –Jacques-Hyacinthe-Simon Delorme. These signs downtown all very helpfully list who the street is named for. Although, the sign here gives his birthdate as 1722 whereas all other sources say 1720. Jacques-Simon – also known as Hyacinthe – Delorme was born in Quebec City and trained as a carpenter. By 1745 he was in the naval service of Louis XV building platforms, carriages and artillery works necessary for cannon installations. 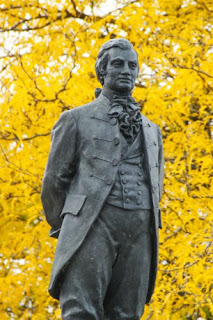 This was lucrative enough for him to buy the seigneury (manorial land tenure) which was to become Saint-Hyacinthe. 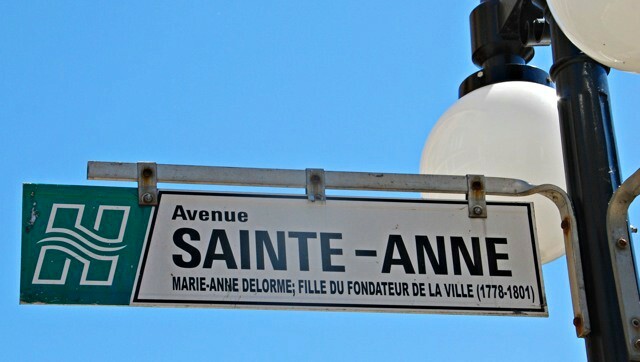 There is also a Avenue Sainte-Anne, named for his daughter. Here there is also a slight discrepancy, as it seems he had three children, a daughter Marie-Anne who was born and died in 1776 and another daughter Anne-Marie who was born in 1779 and lived until 1801. Since our Simon died in 1778... it is possible he never knew this daughter or, of course, the date could be wrong. There was also a son, named Hyacinthe-Marie. The H on the sign would be for Hyacinthe, with the squiggle in the middle of the H for the Yamaska River which bisects the city. I think more street signs should be so informative. Interesting origin of these street names. His daughters did not live long. But life was tough in the 18th Century.